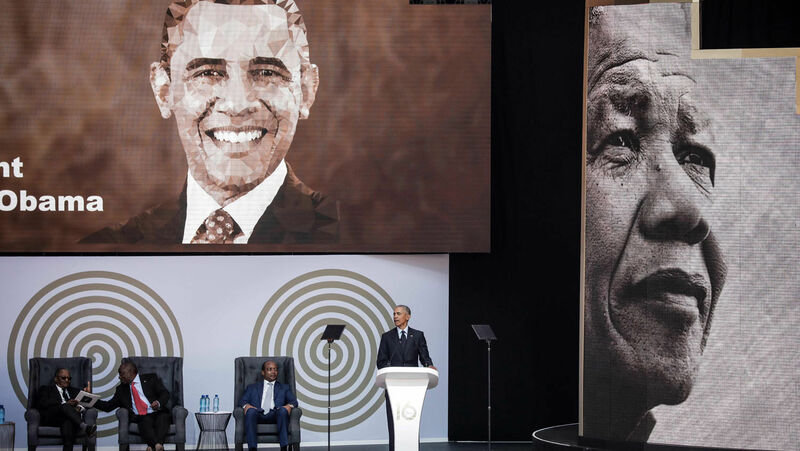 Former U.S. President Barack Obama speaks during the 2018 Nelson Mandela Annual Lecture on July 17. The former president obtained office by covering up his radical past, but he is now openly expressing some of his radical views. In his first major speech since leaving office, former United States President Barack Obama voiced support for a universal basic income. Speaking at the Nelson Mandela Annual Lecture in South Africa on Tuesday, he warned that technology was supplanting manual labor as the driving force of production. He suggested a universal basic income, a scheme where the government would provide every citizen with a certain amount of money. The idea of a universal basic income has become more popular within the U.S. Democratic Party since the 2016 election cycle, with the deputy chairman of the Democratic National Committee praising the concept as having “a lot of merit.” A Northeastern University-Gallup survey suggests that 48 percent of Americans would support a universal basic income. That is a fourfold increase in 10 years, according to economist Karl Widerquist. Obama’s connection to this policy, however, is not a new development. On Jan. 11, 1996, he signed a contract promising to publicly support and associate himself with the New Party during his campaign for the Illinois Senate. This party was a socialist organization in Chicago, Illinois, that was deeply hostile to the idea of free-market capitalism, a system that emphasizes leaving individuals free to seek their own opportunities, work for their own earnings, and buy and sell based on their own decisions. The New Party functioned primarily as the electoral arm of the Association of Community Organizations for Reform Now and was deeply influenced by the economics of Frances Fox Piven. Obama was quiet about his past association with the New Party during his presidency. But he did predict in 2016 that people would be debating whether to implement schemes of unconditional free money “over the next 10 or 20 years.” Stockton, California, is now experimenting with a pilot version of universal basic income, and Alderman Ameya Pawar is proposing a similar program for Chicago. The adoption of such a policy as a means to end poverty, however, is a recipe for disaster. Piven—and likely Obama—knew that unless the United States adopted a full-blown socialist economic system, this scheme was only good for overloading the welfare system and threatening the destruction of the economy. Robert Greenstein of the Center on Budget and Policy Priorities explained that a check of $10,000 to each of 300 million Americans would cost the nation more than $3 trillion. That equates to all the federal tax revenue currently collected each year, meaning that if the government wanted to keep paying for defense, education, transportation, Veterans benefits, Social Security, Medicare, Medicaid and health care, it would have to double taxes. The Bible warns against a get-something-for-nothing mentality. King Solomon warned that poverty comes to those who don’t work (Proverbs 6), and the Apostle Paul wrote that if someone doesn’t work, he won’t get to eat (2 Thessalonians 3:10). Yet Americans have turned away from the economic principles outlined in the Bible and have followed after new economic philosophies, like those espoused by Frances Fox Piven and Barack Obama. This is a big reason why America’s national debt has increased 10-fold since 1986, even without the adoption of a universal basic income. In Deuteronomy 28, God specifically warned that debt problems are one of the many curses caused by disobedience. Specifically, God warned that if the nations of Israel (the modern-day nations of the U.S. and Britain, primarily—read The United States and Britain in Prophecy for proof) turned away from Him, strangers would lend them money, but they would not lend to others. To learn more about the dangers of out-of-control government spending, read “The Biggest Threat to America’s National Security,” by Joel Hilliker.